Recipes, sometimes, are like dreams. You experience them but then, quite often, you forget that you’ve experienced them. And then you’re standing somewhere, and the memory floods back to you: “I was being chased by a gorilla through Filene’s Basement!” Or, in this case, “I once made a corn chowder so good that I wrote a post called CORNGASM and didn’t even share the recipe.” That was back in 2007, after I’d interviewed Chef Jasper White for Salon.com. All these years later, the memory of that chowder came back to me as I started planning the menu for our V.I.P. dinner guests. 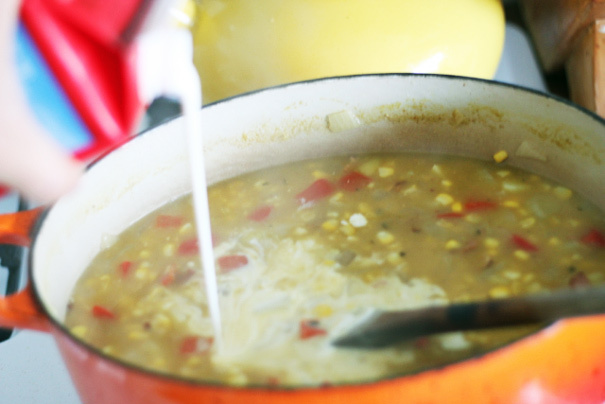 And after making it again, I can assure you: it really is the corn chowder of your dreams. What makes it so good? Well, when corn’s in season, it’s a beautiful thing: a big, bright, burst of summer before it gets chilly (here in L.A. that’s 70 degrees). Then there’s the recipe itself. Chef Jasper White is not the kind of chef who demands the spotlight; in fact, it seems like he mostly shies away from it. But he was Julia Child’s favorite Boston chef and if you go on to Hulu and load up old episode of Julia’s Cooking with Master Chefs, you can watch them cook together; she really takes pleasure from him and his food. And no wonder; it’s really solid, smart stuff. As proof: look how this chowder starts. That’s right: bacon. And lots of it. Then comes the aromatics: the onion, the red pepper, thyme, turmeric, cumin, and a little butter just because the more fat, the better. 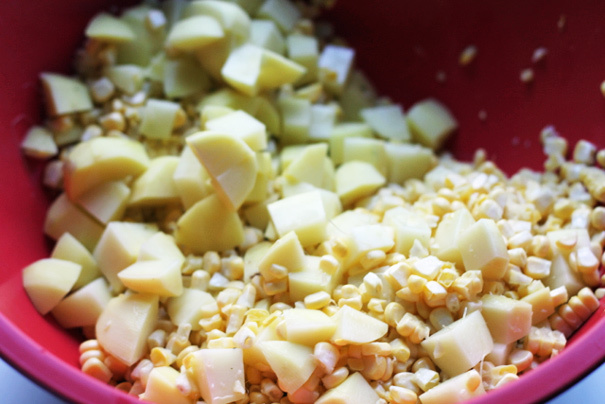 After that, you add the fresh corn kernels (don’t make this with frozen corn, it’s not worth it) and cubed potatoes. The process after this point is rather intense and, therefore, fun. You cover the corn and potatoes with chicken stock, bring to a rapid boil, and cover and allow to boil–full, big bubbles–for a whole ten minutes. Then you check the pot and see if you can smush corn and potatoes against the side. When you can, you thicken with corn starch mixed with a little water. Once the chowder thickens, you turn off the heat and add cream. That’s right, cream. I told you: this chowder is no joke. It’s a wham-bam-thank-you-ma’am kind of affair and when it’s done, it’s hardy enough to be dinner in its own right. As a first course, just two ladlefuls will do the trick. Top with chives and you’ve got a bowl of such goodness, you’ll think you dreamt it. But you haven’t dream it: you’ve lived it. Now, if you’ll excuse me, there’s a gorilla waiting to chase me through Filene’s Basement. 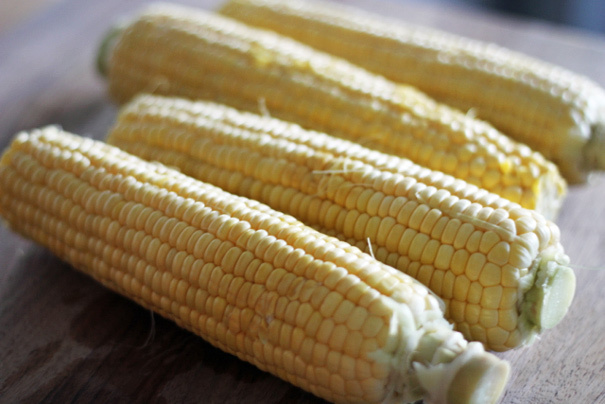 Summary: A hearty bowl of corny goodness for the end of summer, start of fall. 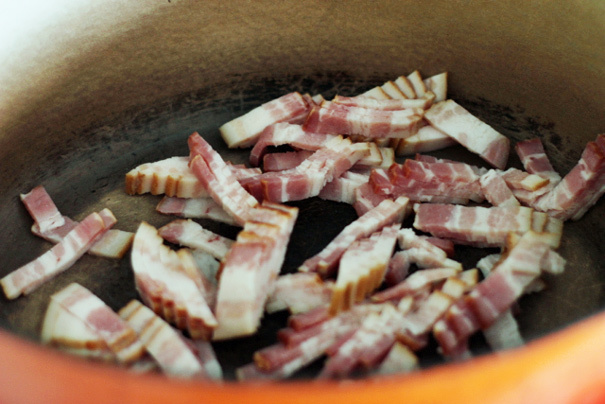 Start by rendering the bacon in a 3 to 4-quart heavy pot over low/medium heat. 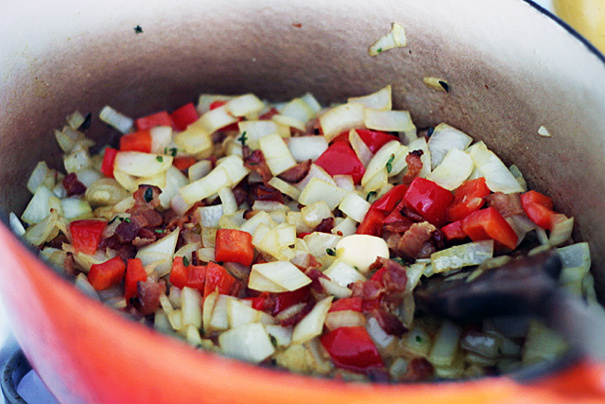 You can add a tiny splash of neutral oil (canola, vegetable) to get the bacon going. Turn up the heat to medium and cook until the bacon is crisp. Then spoon out all but a tablespoon of bacon fat. Add the butter, onion, bell pepper, thyme, cumin, and turmeric along with a pinch of salt. Continue to cook for about 8 minutes, stirring every so often, until the onion is translucent. Then add the corn, potatoes, and stock; turn the heat to high, bring to a vigorous boil, and cover and cook for 10 minutes. 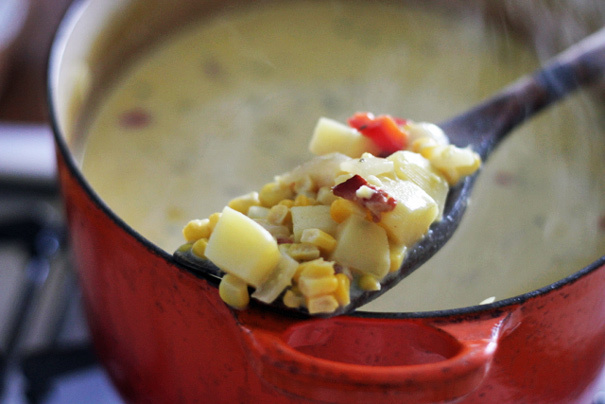 Smush some of the corn and potatoes against the side of the pot with a wooden spoon to thicken the chowder. Reduce the heat to medium and taste for salt and pepper. 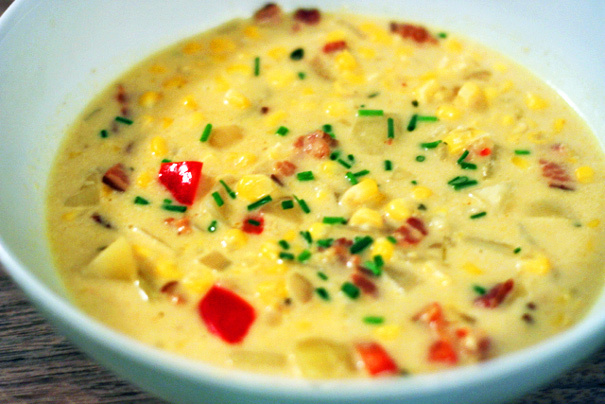 Now stir in the corn starch mixture, bring back to the boil, and stir until the chowder has thickened to your liking. Off the heat, add the cream and adjust for salt. Serve immediately in bowls with the chopped chives.